1 What causes Mouth Ulcers? Home Remedies for Mouth Ulcers: The small mouth sore can cause a great pain and irritation. It doesn’t let us eat or drink peacefully. More than the pain they are much irritating. So, know how to treat mouth ulcers by using Home remedies. Before that know that what are the causes of mouth ulcers. Just like any other ailment, mouth ulcers also have many causes. A single mouth ulcer may occur due to biting the cheek or tongue by your teeth, improper brushing or poorly fitting dentures. It is not fair to depend on medicines for every problem. Mouth sores is not a big deal until and unless they occur due to internal illness. Salt water rinse can heal your canker sore in a short time. So, Rinse your mouth with salt water for about 30 seconds thrice a day for two days. Make sure that the salt concentration should be high to treat this condition. The Higher levels of salt (sodium chloride) can draw the water molecules from the surrounding tissues by osmosis. So, this helps in healing the canker sores. Mix a teaspoon full of salt in 200ml of water and rinse it thrice a day. Honey is one of the best antibacterial agents that also possess anti-inflammatory properties. So, we can use this honey to treat mouth ulcers. Honey coats the ulcer and reduces the inflammation and redness in one day. Just swish your mouth with warm water ( you can also use salt water for this to enhance the healing process). Then just apply organic honey on the canker or mouth sores and leave it as such. Reapply several times in a day. Also, apply before you sleep as you will not eat or drink anything after that which can heal this much faster. Coconut is an amazing mouth ulcer home remedy. All the three forms of coconut, i.e., Dry coconut powder, coconut oil, and coconut water are very helpful in the treatment of mouth ulcers. They can provide a cooling effect and relieve the sores. 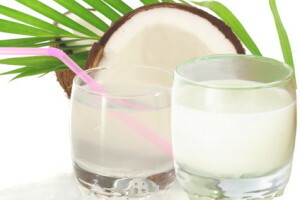 Drink coconut water twice a day to get rid of mouth ulcers fast. It cools the body and reduces the redness and inflammation immediately. Also, you can apply coconut oil directly on the sore itself. Chew a 3-inch piece of coconut to ease the pain and inflammation. Poppy seeds also have a cooling effect on our body just like coconut. According to Ayurveda, excessive heat in our body manifests as mouth ulcers. So, the poppy seeds are a good remedy for mouth ulcers. Therefore, Mix sugar and crushed poppy seeds and consume this for instant relief from ulcers. It renders the best Mouth ulcer treatment with a sweet taste. Holy basil leaves possess highly potent medicinal properties. It is evident that they can cure many diseases from common cold to cancer. So, Chew a few leaves of holy basil along with some water thrice a day. It assists in getting rid of ulcers faster and also prevent their reoccurrence. Ice cubes and ice cream are very cold which when kept in our mouth can create numbness that. It is an effective natural home remedy for mouth ulcers. So, try rubbing a piece of ice or just keeping it on the mouth sore for few minutes to relieve the pain. It is one of the best Home Remedies for Mouth Ulcers that is inexpensive, safe, simple. The licorice roots are very potent in mouth ulcer treatment. It is rich in antioxidants and also possesses anti-inflammatory properties. All these make the licorice the best natural medicine that treats the ulcer in intestine and mouth. The active compound carbenoxolone present in this plays an important role in healing mouth and gastric ulcers. If you take roots for the mouth ulcer treatment, then rub the root on grinding stone by adding little amount of water to it. And collect the sufficient amount of paste and apply it on the canker sore. If you use powder directly, then add honey and medicinal glycerin to it and apply it on the mouth ulcer. Aloe vera is a miracle plant that cures many ailments naturally. So, try the aloe vera gel on the mouth sores. The aloe gel, when applied on the affected area, can reduce the pain and promotes the healing. Aloe vera is a natural Antibacterial and antiseptic agent. So, it can also reduce the causative microbes if any. Many pieces of research found that Aloe vera can deal with oral problems like mouth ulcers, cold sores, etc. Always use a toothbrush that suits you and also brush twice a day. Try to use a straw while drinking cold drinks to avoid the cold shock. Include the comforting foods like curd (yogurt), ice-cream, and custard. They can help in reducing the irritating effect. Stay away from the hot and spicy foods which can increase the condition. Also, say a big no to coffee and tea. Avoid consuming alcohol and tobacco or any other nicotine-containing products. 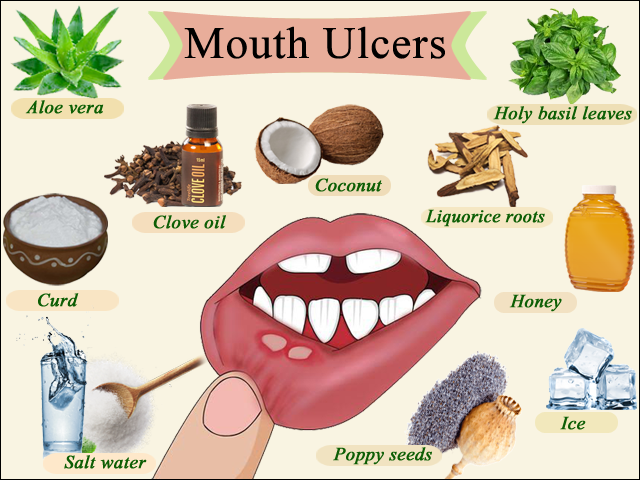 So, these are the best Home Remedies for Mouth ulcers that you can give a try. Besides following these remedies for mouth sores, try to follow the precautions also. If the mouth ulcers are recurring then immediately consult a medical practitioner and seek advice immediately.